Turkish Airlines confirmed it is subject to the U.S. airline electronics ban on March 21. Following the distribution of a "confidential" edict from the U.S. Transportation Safety Administration (TSA), airlines flying directly to the United States from 10 airports in eight countries, including Turkey, will allow only cellphones and smartphones in carry-on bags for U.S.-bound flights, the Trump administration said Tuesday. Other electronics, including laptops and tablets, will be indefinitely banned from the passenger cabin. 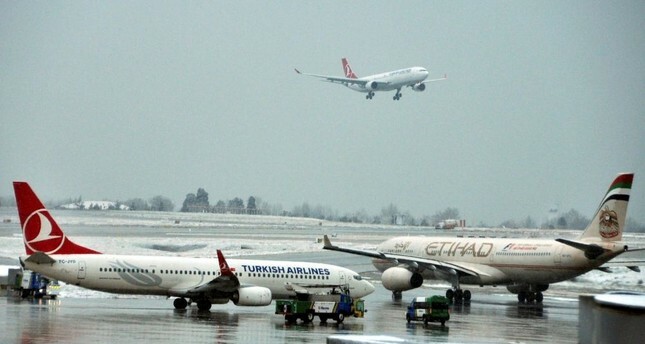 However, efforts to more broadly restrict laptops on planes will not affect those passengers flying to the United States from Atatürk Airport, who will continue to enjoy the exceptional in-flight service. Since 2016, THY passengers have been using Global Communications Services on board while not needing their electronic devices that are larger than cellphones. THY said it was one of the airlines subject to a U.S. ban on passengers carrying electronics larger than cellphones aboard flights bound for the United States. "It has been decided by the relevant authorities that electronic devices larger than cellphones or smartphones should not be allowed inside the cabin," on U.S.-bound flights, Turkish Airlines said in a statement, adding that medical devices were exempt from this. Making U.S. flights a key part of its strategy, THY flies nonstop to Los Angeles, New York, Atlanta, Houston, San Francisco, Washington D.C., Dallas and Chicago. The electronics ban affects flights from international airports in Amman, Jordan; Kuwait City, Kuwait; Cairo; Istanbul; Jeddah and Riyadh, Saudi Arabia; Casablanca, Morocco; Doha, Qatar; and Dubai and Abu Dhabi in the United Arab Emirates. About 50 flights a day, all on foreign carriers, will be impacted. The officials said the airlines were to have 96 hours to implement the security order or face being barred from flying to the United States. EgyptAir said it will begin banning most electronics on its Cairo-to-New York flights starting Friday, after receiving new travel instructions from U.S. authorities. Details of the ban were first disclosed by Royal Jordanian and the official news agency of Saudi Arabia. In its statement, Royal Jordanian said the electronics ban would affect its flights to New York, Chicago, Detroit and Montreal. Dubai-based Emirates said Tuesday the ban takes effect on Saturday. That guidance differs from the information provided by senior Trump administration officials, who have said the ban is in place from Tuesday. Emirates is the largest Middle East carrier operating to the U.S. with daily flights to 12 destinations. Etihad flies daily to six U.S. cities. Earlier, Reuters reported the ban would include airlines based in Jordan and Saudi Arabia, where state carriers Royal Jordanian Airlines and Saudi Arabian Airlines (Saudia) fly to the United States. Washington is hosting a meeting of allies in the international coalition against Daesh this week. That means the U.S. expects a large number of arrivals from Muslim and Arab countries. CNN quoted a U.S. official as saying the ban was believed to be related to a threat posed by al-Qaida in the Arabian Peninsula (AQAP). In a statement, the U.S. Department of Homeland Security said: "We have no comment on potential security precautions, but will provide an update when appropriate." The move would mark the latest attempt by President Donald Trump's administration to tighten security at U.S. borders, after its bid to curb travel from a group of Muslim majority nations was twice blocked by the courts.